Have an iPhone or an iTouch? Then chances are that you enjoy apps. Apps are software applications that can let users do a variety of things and have become a huge part of modern society. Games are a very popular apps and are enjoyed by many. The games can be anything from simple puzzle games, to complex shooting games that rival those used on other popular hand-held systems. Although not all the apps are free, some games must be bought and many are more popular than the free games. Even though these games come in all shapes and sizes, for senior Nick Hartley it’s Angry Birds. He plays it on his iPhone 4. “You can play it whenever because its your phone and you always have it,” explained Nick. That is one of the aspects that makes these games so popular. Student Kayla Morgan agrees with Nick. “It’s different and funny, it both relieves and causes stress,” she said. She also enjoys the convenience of mobile games. Some of the most popular games in the school are Fruit Ninja, Tiny Wings, Doodle Jump and Angry Birds just to name a few. After trying out a host of games, I’ve come up a top ten list of iPhone games. 1. 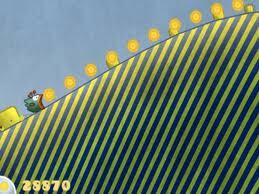 Tiny Wings Tiny Wings puts the player in control of a small bird that “flies” by sliding down hills. By tapping the screen, players must use precise timing in order to gain speed and fly further before descending again. By flying, players travel to different islands and beat the nighttime all while gaining points along the way. Although it has a slight learning curve, the cute and simple game is addictive and fun. It is a great $1 game to add to your phone. 2. Angry Birds The massively popular Angry Birds puts players in control of a variety of birds. In the game birds have had their eggs stolen by green pigs and you attempt to get them back. By dragging a finger across the screen, players launch the birds into structures that fall on the pigs or directly into the hogs to destroy them. A crazy number of levels and constant updates keeps the game from getting old. Some levels may cause a bit frustration but the game never sways from being fun. 3. Doodle Jump In Doodle Jump, the user plays as a small alien like character that leaps off of platforms to ascend higher and higher. Holding the device vertically, players must tilt the screen in order to keep the creature from falling. By bouncing off of trampolines and using rockets, players can effectively increasing their score. It is another game with plentiful updates and spin offs, so it’ll keep you wanting to beat your own high scores. 4. Fruit Ninja In Fruit Ninja, players must slice different fruits as they fly across the screen. Using their finger, players swipe and slice the fruit, while obtaining points and avoiding bombs that end the game. Gaining higher scores can lead to unlocks such as a flaming sword or backgrounds that keep the player interested. Although responsive, the game couldn’t keep my attention for as long as some of the higher games on the list. 5. Plants vs. Zombies Another game that has gathered a ton of popularity is Plants vs. Zombies. To stop a wave of zombies from reaching your house, players must place a variety of plants in their lawn to battle the walking dead. A silly story, ridiculous enemies, and large catalog of plants make for a long, enjoyable game. A few extra modes and new game play mechanics add up to an already addicting game and will keep you fighting in the lawn for quite some time. 6. Words With Friends A fairly new game with a growing fan base is Words With Friends. This game is about as casual as it gets. Words With Friends is essentially Scrabble. Those looking to play the word game without a board have everything they need. The ability to have multiple games going at once and an alert notification of when you opponent has made a move keeps Words With Friends up with the cream of the crop. 7. Drop7 is a puzzle game that takes some time to learn but rewards those who do. The game is an odd combination of Tetris and Sudoku. Players must prevent a pile of continuously rising numbered bubbles from reaching the top of the screen. Bubbles will disappear when a row or column matches the number on the bubble itself. The learning curve will intimidate some players, but once you know what you’re doing, Drop7 is a rich puzzle-playing experience. 8. Infinity Blade Although it’s the most expensive game on the list, it also looks the best. With tap-and-swipe controls, players embark on a quest as a knight to defeat the God-King and free the kingdoms citizens. The game boasts the most impressive graphics on a phone to date and is also fun to play. For $5.99 players will enjoy the console-worthy graphics and exciting game play. 9. SuperMega Worm As the name suggests, players control a huge worm on a mission to destroy everything on the surface of the planet. By launching from the earth to eat and absorb the surface life, players use a slider that controls the path of the massive worm. The game is awfully violent, and some will appreciate the intense violence this game bring to the table, and some not so much. Though certainly entertaining, SuperMega Worm isn’t for everyone. 10. Flight Control Simple, fun, addictive. Those three words sum up the air-traffic controller game. Players must draw lines to safely land planes along the runway. A very basic but fun time waster, so players shouldn’t expect too much. Still, a long car ride or a little boredom and you’ll find yourself playing this game more than a few times. After playing all of the games and speaking to those who have done the same, I have come up with the top games that are addictive because they are fun and can keep a person’s attention for quite some time. With the iPhone and iTouch gaining more and more popularity, there will be more addicting games out there trying to do the same. Zombie Farm, and Trade Nations are also good. JellyBugs, Ant Smasher, Smack That Gugl. Wow! Finally I got a blog from where I be capable of genuinely obtain helpful data regarding my study and knowledge.